Okay yall guess what!!! 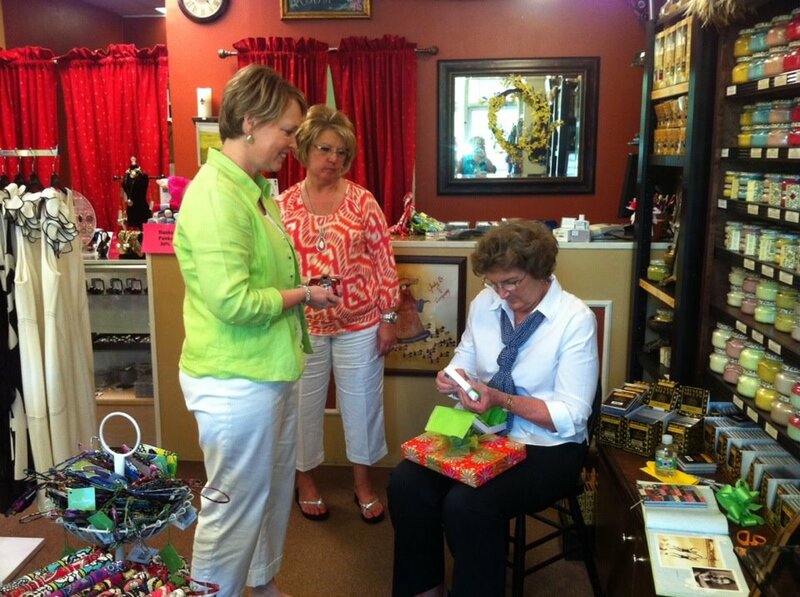 Judy B's was recently selected to get a visit from Joan Bradley, Vera Bradley's daughter. 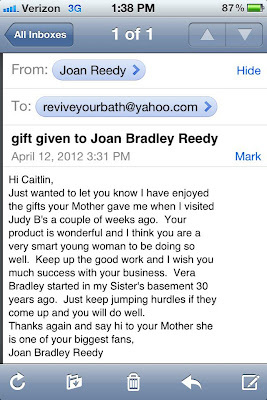 While she was in the store, she noticed my products and even tried my lavender shea butter body cream! Needless to say, she loved it! That's my mom in the green shirt! She works at Judy B & Company. 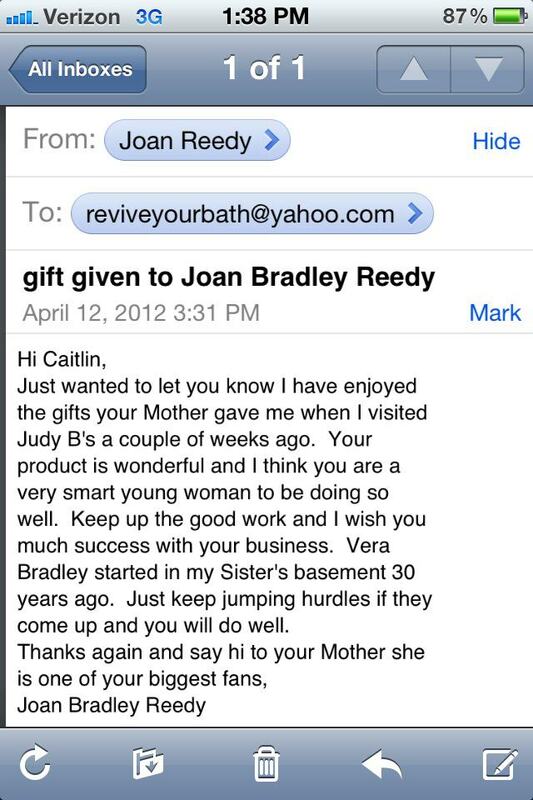 A few weeks after she received my products, she sent me an email. What an honor for her to take time out of her busy schedule to email me! 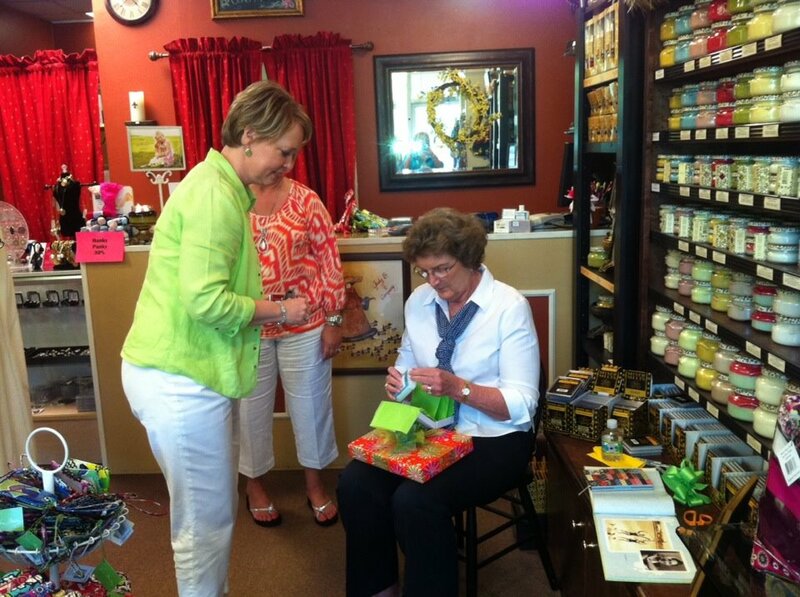 Judy B's has just recently stocked up on our products, so make sure to stop on in and grab a few bars for Mother's Day! After all that, I was in the Big Shanty Festival April 21-22, 2012. Here are a few pics! 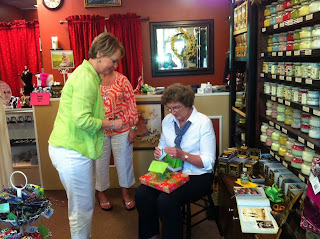 My momma helping me package/shrink wrap soaps before the show. There was a parade before the craft show started - had to get a picture of he UPS truck with flames!! Yall!! This is a new shelf my dad made for me! The shelves are removable and it folds down (like a ladder) for easy transport. It's awesome!! I changed up my display for this show season. This year I am including two new apple crates to show off my gift sets. Even though I liked the random soap display I used last show season, I wanted to sell the soaps wrapped instead of unwrapped. This is the new display look I did for this year. I also offered bulk soaks for the first time!! I was very excited about this. Basically the customer takes a jar, fills with with desired amount, weighs it, and the price is based on weight. I will be uploading pictures onto Revive's facebook page so check that out to see even more pictures from the craft show. This week is finals so I am taking a break from studying to make a post. I have a final tomorrow in my business statistics class...ew! And now for the last piece of awesome news! While I was at the craft show, I met this guy named Rob. Rob is the owner of a marketing company called Lighthouse Marketing located in Marietta, GA. He was so interested in my business and branding and was asking tons of questions about my design work and everything. We have been emailing back and forth since then talking about a possible job at his marketing company!!!!!! I am so excited about this!! Owning Revive has opened so many doors for me. After finals, I will be setting up a meeting to talk with him and a few other people there. Hope everyone is having an awesome Spring! What a fun update post!! You've been so busy - congrats on your celeb endorsement! :) Your display looks fabulous too - keep us posted on the marketing job! Your market table is by far THE nicest one I have seen. Great job. Everything is so cohesive. Keep up the wonderful work. Congrats on your news about a possible job. I've said this before, love that shelf your dad built. Think he should start selling these for those of us who do markets. You labels for the bath soak jars are great. Sounds like a lot of opportunities are coming your way. Thanks everyone for your encouragement!! I love your work, pretty nice your stand and the way you display all, the best idea was the bulk option for customers!